If you Currently Upgraded to Windows 10 and have Integrated or External Camera, Then you may not be able to use it because of Error code 0xa00f4244. Earlier we posted Series of post covering Various Windows 10 Update errors that users were getting. To be Exact, the Message will pop up saying "We can't find your camera. Check to be sure it's connected and installed properly, that it isn't being blocked by antivirus software, and that your camera drivers are up-to-date. If you need it, here's the error code: 0xA00F4244(0xC00D36D5)"
Camera cable that is connected to motherboard might be Faulty. There might be few more reasons but what matters is how to fix error code 0xa00f4244 in Windows 10. So let us see how to do it. Updated on 8th September 2016. This is a very basic thing that lot of us miss. You need to Turn on Camera first. 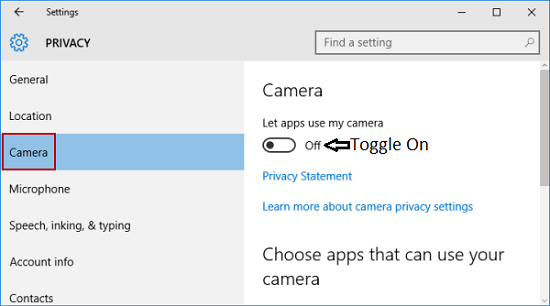 If you have just installed Windows 10 then, chances are Your Camera is turned off and so you are shown 0xa00f4244 error every time you launch the camera. Go to Start > Settings. Or hit Win +I key to open up settings in windows 10. Click on Privacy from the options Provided in the Settings Window. From the left pane, Select Camera and Turned it ON if it is OFF. Close the Window and Launch Camera. If the camera itself was turned off, Your Problem of this error code will be solved Instantly. Otherwise, check below methods shared. Method 2: Change Settings in Antivirus. Many Antivirus have options of not allowing to use Camera because of security reasons. If you have an Antivirus, go to its settings and see if by Mistake you have not allowed to use your Camera(Webcam). If you don't find any such Options, Then simply Turn off your Antivirus temporarily. Now go and launch the Camera and see if the problem persists. If your Recently Installed Windows 10 is throwing Error Code 0xa00f4244, then it's quite obvious that you need New and Updated Drivers for your Camera. Integrated or External, Both Cameras need Up-To-Date drivers. Updating Drivers is quite a task, and it may take lot of time finding the right drivers for your hardware. - If you are having issues with Integrated Camera then, Search your manufacturer's website for necessary drivers. You can also go to Device Manager, Expand Imaging Devices to find your camera. Right Click on it and click on Update Device Software. - If you have an External camera attached and having problem with it then, Go to Device Manager, Under Sound, Video and Game Controller you can find your External Camera. Again, Right click on your camera name and do Update Device Software. A new window will pop up where you have to select Search Automatically for updated driver software. It will now search your Computer and the Internet for required drivers. Note: if you do not See your Camera in Device Driver then, Plug your Camera in so other Port and see if it is now shown to you. If it still doesn't show, Click on Scan for hardware changes icon on the top or Click on Actions > Scan of Hardware Changes. Method 4: Roll Back to Windows 8.1 or 7. This one is for Windows 10 users only. 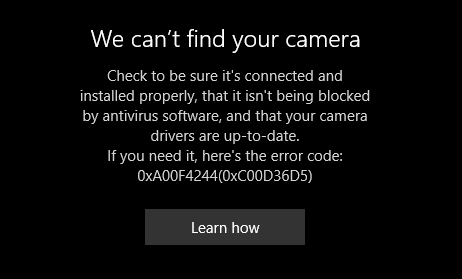 If all 3 Methods fails to fix Camera not working error Code in your Windows 10, then your Camera might be not compatible with Windows 10. Do you have a Old External Camera? Then, it might not work on Windows 10. Just Roll Back to your Previous version of Windows and this might very well fix the camera problem. Our Research and Discussion about this particular error code has shown that Rolling back to Windows 7 or Windows 8.1 has fixed the problem. This will work only if your camera was working perfectly and it stopped working after windows 10 upgrade. That is it; These are 4 Methods I wanted to share which might help visitors to fix Error Code 0xa00f4244 Windows 10. If any of the above steps were useful to you, then let us know in comments below. To me it does not work and I've tried everything, the only thing that has worked for me on other computers is with the tool restore Windows 10 and once restored disable updates. Even when I go into Device Manager, I have no imaging software listed. The camera worked a month ago and then suddenly, my Vaio updates and it's gone. GOOD TO LEARN BUT NOT WORKS.